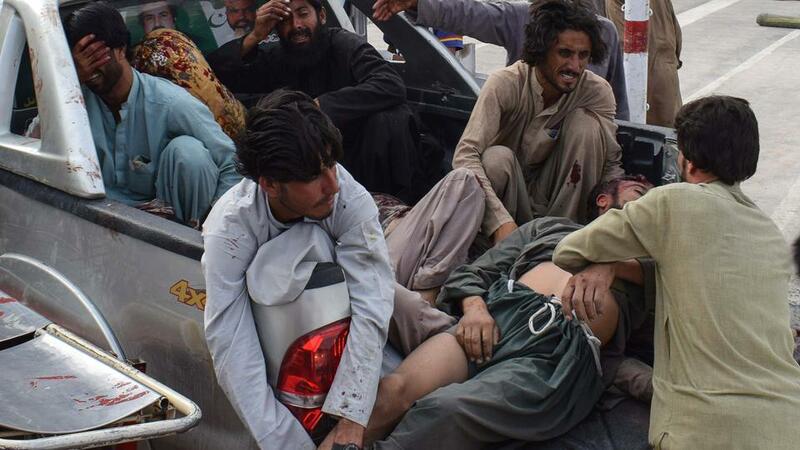 A suicide bomber hit a political gathering in Mastung district of Balochistan at least killing 85 people, including BAP candidate Mir Siraj Raisani, while an IED blast earlier during the day killed four people in Khyber Pakhtukhwa’s Bannu district. A suicide bomber killed 85 people at an election rally in southwestern Pakistan in the second election-related attack on Friday, officials said, amid growing tensions over ousted prime minister Nawaz Sharif’s return ahead of the July 25 vote. Balochistan caretaker health minister Faiz Kakar told local reporters that the death toll of the blast in Mastung had risen to 85 with more than 150 others wounded. Police had earlier said that more than 1,000 people were in attendance at the rally. The Daesh terrorist group claimed responsibility for the suicide attack in Balochistan. The claim could not be independently verified. Caretaker Home Minister Agha Umar Bungalzai earlier confirmed that the explosion also killed Siraj Raisani, who was running for a provincial seat with the newly-formed Balochistan Awami Party (BAP). Raisani was the younger brother of former provincial chief minister Mir Aslam Raisani. “My brother Siraj Raisani has been martyred,” said Haji Lashkari Raisani, another brother who is also contesting a national assembly seat from Balochistan. The explosion comes hours after four people were killed and 39 injured when a bomb hidden inside a motorcycle detonated near a Pakistani politician’s convoy in the country’s northwest on Friday, near the Afghan border. The earlier bomb, near the town of Bannu in Khyber Pakhtunkhwa province, was targeting the convoy of Muttahida Majlis-e-Amal (MMA) candidate and former minister, Akram Khan Durrani, who survived the attack, police said. No group has yet claimed responsibility. With the July 25 polls in the country fast-approaching, there has been a spike in violence with three major attacks targeting election campaign events and candidates during the past week. On Tuesday a bomb claimed by the Tehreek-i-Taliban Pakistan (TTP) militant gorup targeted a rally by the Awami National Party (ANP) in the city of Peshawar. Hospital officials said Friday that the toll in that attack had risen to 22. Local ANP leader Haroon Bilour was among those killed. Thousands flocked to his funeral the next day. Bilour was part of the predominantly secular, ethnic Pashtun nationalist Awami National Party, which has long competed with religious parties for votes in Pakistan’s volatile Pashtun lands, along the border with Afghanistan. Local media has reported two separate minor bomb attacks in Balochistan’s Khuzdar district and Bannu district of Khyber Pakhtunkhwa province during the month. Following the attacks, activists called for Pakistani authorities to remain vigilant to protect candidates during the final days of the campaign season. “The Pakistani authorities have a duty to protect the rights of all Pakistanis during this election period – their physical security and their ability to express their political views freely, regardless of which party they belong to,” said Omar Waraich, deputy South Asia director at Amnesty International. Analysts warn however that Pakistan has yet to tackle the root causes of militancy.